Tuesday, I hopped on Pig for our first real day back on schedule and in full work. He was having none of it. 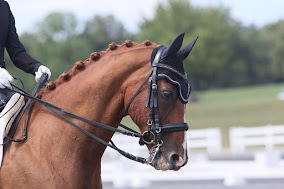 Every change of direction was met with complete stiffness, each tap from the dressage whip was met with bucking. Guys, it was bad. Baaaaaaaad. 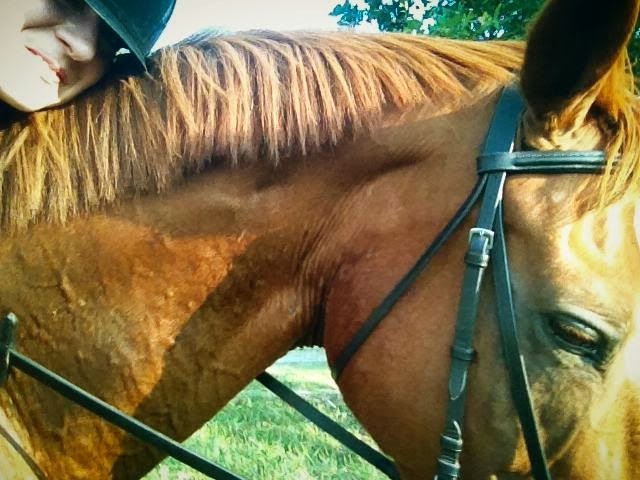 By the end of the ride, all I wanted was for him to bend off my left leg and fill up my right rein. Just a little. According to Pig, bending off the leg and touching the right rein was illegal that day. I was using my left leg so much that I couldn't keep it down. Every couple of strides, I'd flick Pig with the whip to try to lighten him. He was so ticked off he kept trying to swipe my whip away with his back leg. It was very athletic, though he tended to throw himself out of balance by doing this. One plus? I was sitting up pretty darned straight. Anything else and I'd have been up on his neck. Bad pony. Last night, I headed back out for another go. I was ready for more of the same awful reaction to the whip and resistance throughout. Luckily, I'd watched the above video about 1,000 times and had some ideas of how to change myself to get better results. Give more breaks and ask for more of an active swinging stretch during warm up and during the ride. Ask for this stretch at all gaits (canter especially). Lift up my abdominals on the inside of my upper body. I'm thinking back to a January lesson with Nancy in which she asked me to raise my body under my armpits. but not to move my shoulder. Think, lengthen the torso on the inside. "Magically" our ride was so much better. Of course, no one was around to video it! 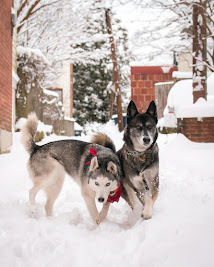 The stretching was tough, as always. I'd been using stretchy trot every day before our break, but had forgotten to add it back in. I'm glad I remembered so quickly. Introducing the idea of stretching into contact at the canter was an interesting process. It took a lot of leg and a lot of half halts to keep Guinness from falling on his forehand. 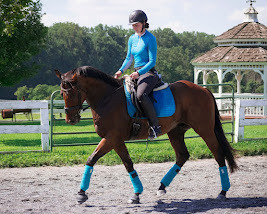 We started our stretching on the circle, then would "lengthen" down the long side to really push his topline out. The whole exercise seemed to really relax him at the canter, which is awesome. Obviously we'll keep doing this (until I forget ... again). Lengthening my torso was probably the biggest breakthrough. I always struggle to drop my right hip, which makes weighting the outside seatbone incredibly difficult and causes Pig to struggle to balance under me. As it turns out, lengthening my left side allows my right hip to drop significantly. The action also loosens my hips, which makes turning inside the rein space so much easier - and keeps my lower leg longer! Thank you inner tape-recorder for deciding to play back that particular Nancy lesson! Here's to a successful weekend of riding for everyone! A happy Pig, and a happy rider. Ooh! He was being a stinker, wasn't he? So bad! All I could do was laugh!